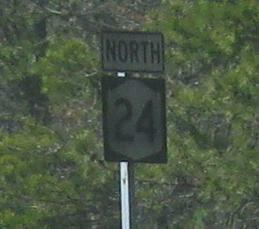 Many Long Island residents know that there are two NY 24's. The first one is in Nassau County and heads west into Queens. They may not realize that it doesn't end when Hempstead Tpk. ends, though I'll explain that more when I get to the photos. 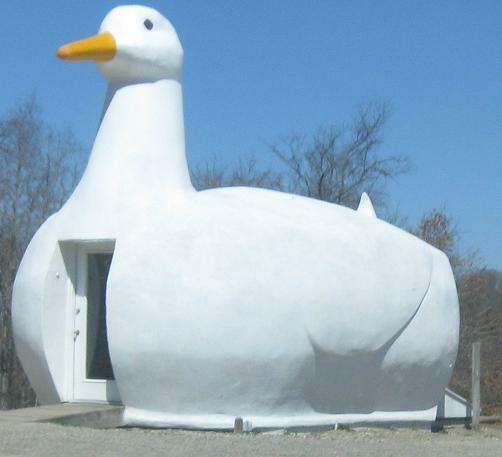 The second one is in Suffolk County and doesn't do much of anything, which again requires further explanation. 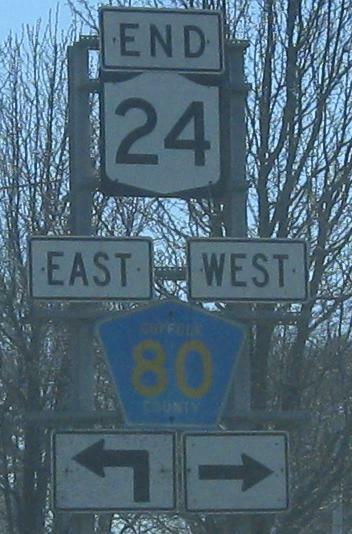 Fact is that there was once a single NY 24, and it even connected the same two pieces that now exist. Long Island Ave., Suffolk Ave., and other smaller roads along the Long Island Railroad right of way had all been part of 24, but presumably were not state maintained. 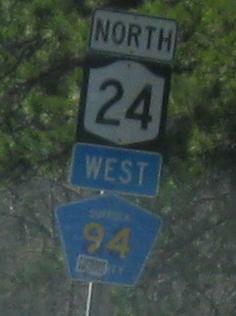 The state upgraded most of what is now NY 24, but dropped the pieces in the middle rather than try. There is still more history here, though. 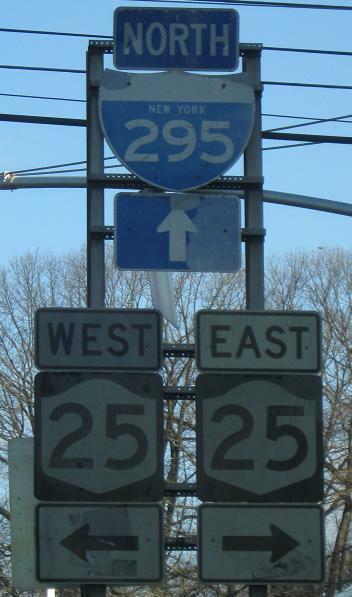 When the Long Island Expressway was first constructed, NY 24 was assigned to the freeway and NY 24A applied to the former surface route. At that time, NY 24 was once again continuous, at least in theory at the point that the LIE would be completed. 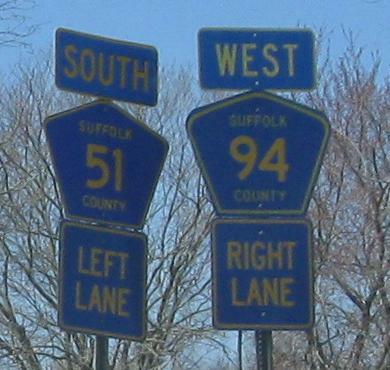 By the time the freeway reached out to connect the two 24's, it was numbered NY 495 (now I-495) and NY 24 was back on its two-piece alignment. The only change since that time was a westward extension of NY 24 along Suffolk CR 94 in order to reach I-495. Except, for some reason, somewhere along the line the eastern NY 24 was redefined as a north-south route, never mind that even that small piece of road goes more east-west. 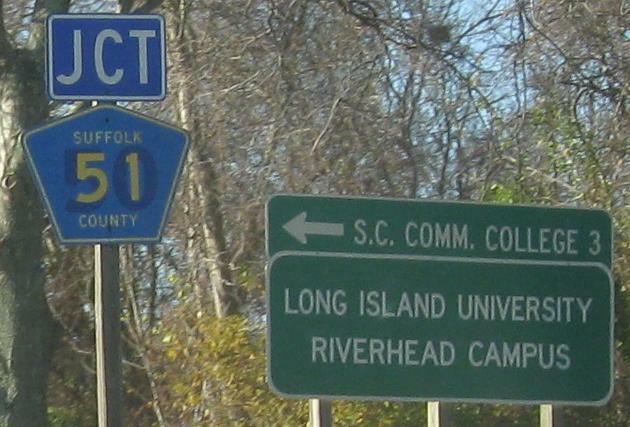 Until CR 94 was constructed, NY 24 ended in Riverhead on Peconic Ave. along with NY 113 (now CR 104) at NY 25. The final bit of intrigue is that the eastern end of NY 24, which was NY 27A, was decommissioned to Suffolk CR 80, but NY 24 was never pulled back to end at another state highway (NY 27). In essence, the route has an end no one knows about (western), an end that's really a county route (northern), a dangling end at another county route (southern), and only one proper end out of the four (eastern). Look at a map, try to clear the confusion, and read on. The end of NY 24 WB on 212th St. in Queens. This is really a secret end, because all NY 24 signage ceased on Hempstead Tpk. Unless you know the route beforehand, you may guess to make a left on Jamaica Ave., but you'd never guess to make a right on 212th St. It's a normal neighborhood street with no center line, parking on both sides, and occasional stop signs, and then you get to these amazingly old signs that completely validate the journey. Every road inside New York City is maintained by NYCDOT, not NYSDOT (city, not state), so it's up to them how/when to sign routes, and I guess they figure NY 24 isn't important to anyone. Given that 212th St. flows straight into I-295, though, it should at least be signed for that road if nothing else - and the other direction should absolutely be signed for NY 24 with no question. Hempstead Tpk. (WB) ends at Jamaica Ave. just beyond this old railroad overpass. Notice the NYCDOT-standard white center lines, which are not MUTCD-standard so should be converted to yellow. 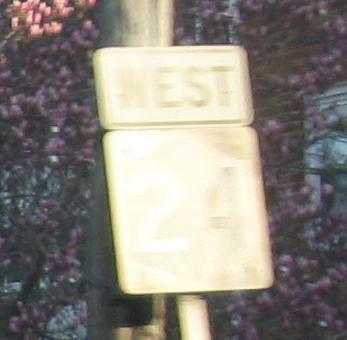 Now that I've explained the western end, you understand why this doesn't say "END 24," even though it's the last reassurance you'll find. Two horrible but necessary WB photographs. 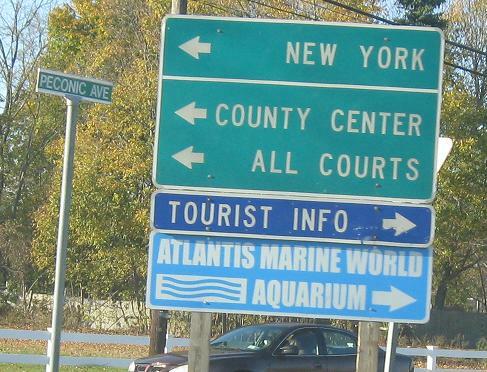 The first is at the Nassau County line not too long after NY 24 begins (for the second time) at NY 110. It is the only representative I saw of the oldest style of reference marker with a larger number on the top line and a dash before it. If the second photo looks like a complete washout, it's because the shield itself is quite washed out already, and the sunlight did not help. 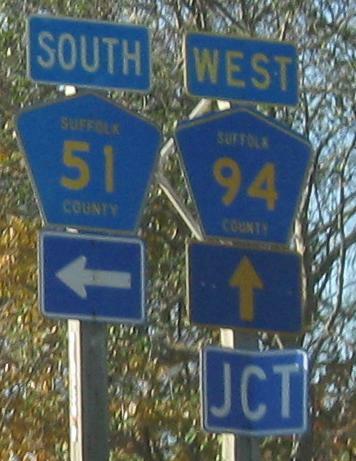 These former WB signs, courtesy Doug Kerr, were the last two signs showing Wantagh as the destination for NY 135 SB, according to Steve Anderson. The Seaford-Oyster Bay Expressway (which really only goes up to Syosset) was supposed to be the Wantagh-Oyster Bay, and was supposed to connect to Wantagh Parkway at its southern end. 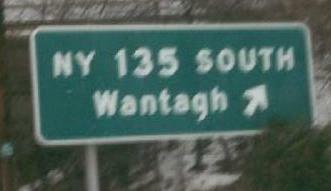 I've also found a few signs whose text was edited to Seaford from the original Wantagh. Since the eastern NY 24 insists on being north-south, I'll start in the south. 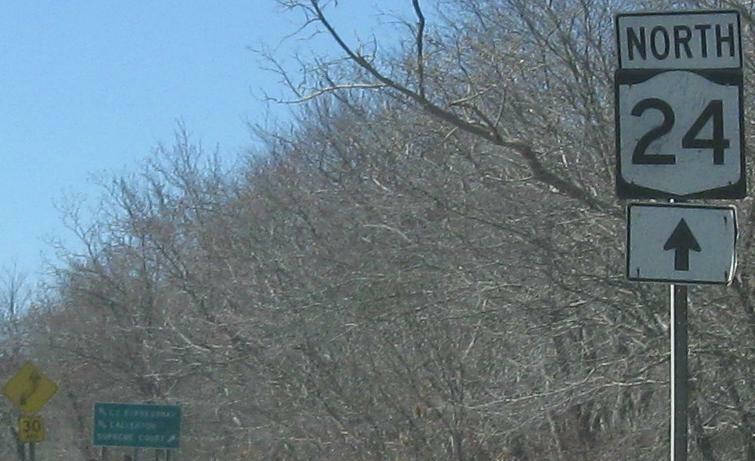 This is as far east as one can get on NY 24, the original Montauk Highway. NB (first two) and SB (last two) just north of there at Sunrise Highway. 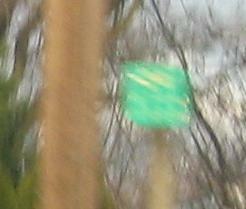 NB through a circle at the ends of CR 63 and CR 104. This is where NY 24 used to follow Peconic Ave. with NY 113 to NY 25, and now picks up the CR 94 alignment to head west. 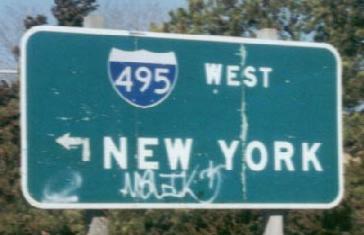 New York is intended as the destination of NY 24/CR 94 via I-495. Continuing NB onto CR 94 WB. See, if the county route is westbound, why isn't the state route? (And why isn't the state route signed?) Clearly the CR 51 shield used to be a 50, and quite a large 50 at that (CR 50 is puzzlingly nowhere near here). I assume the JCT is for CR 94A, the next vaguely circular intersection to the west. Sorry, to the "north." NB at CR 94A, so short it's unsigned. It's just another connection to NY 25, although a county-maintained one whereas Peconic Ave. dropped from state maintenance to town maintenance. 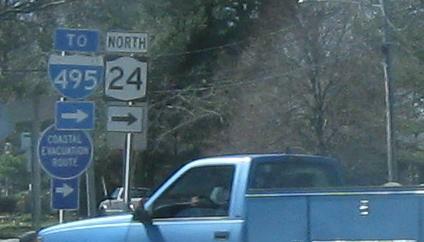 NY 24 is signed very erratically from here on. Sometimes it's not there at all (see above), sometimes it's the only shield there (see the top of the page), and here it's above a recycled CR 63 shield. 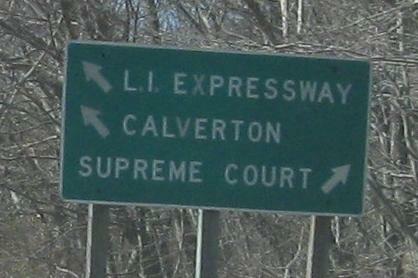 Courtesy Doug Kerr, this used to be at the northern end of NY 24/western end of CR 94, the only place NY 24 meets I-495.